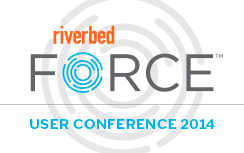 We hope you are as ready for RiverbedFORCE as we are! Not only are we excited to see you, but we can’t wait to see your pictures from Riverbed FORCE. Each day we will randomly select four pictures on Twitter that use the #RiverbedFORCE hash tag. Those selected will receive a $25 gift card to Amazon! Again, those selected will be chosen at random using http://www.random.org. Those selected will be contacted by the official @Riverbed account to get contact and mailing details, so that we can get you the gift card.